Golf is a sport in which players use a club to hit balls into a series of holes on a course, they must use the fewest number of strokes. Golf does not require a standardized playing area. Golf is played on a course which should have an arranged progression of nine or eighteen holes. The holes need to contain a tee box to start from. 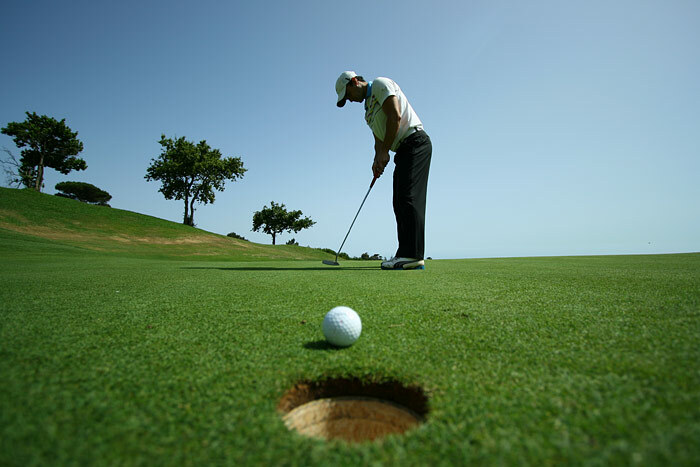 Golf is usually played for the lowest number of strokes by the golfer. It is known as stroke play. Golf can also be played by the lowest score on the most individual holes during a complete round, which is known as match play. The common scores for a stroke are: -4 or condor, which means four strokes under par; -3 or albatross, which means three strokes under par; -2 or eagle, which mans two strokes under par; -1 or birdie, which means one stroke under par; E or Par, which means equal to par; +1 or bogey, which means one stroke over par; +2 or double boogey, which mean two strokes over par; and +3 or triple boogey which means three strokes over par.